The new Bannersnack is here - now with a brand new interface, high-quality resources and faster workflow. We've completely reimagined the banner making process. We believe in time-saving solutions. That's the reason why we've transformed each step into a more intuitive process and we've optimized the workflow to develop a brand new interface which allows you to create static and animated ads in fewer clicks. Now you can find everything that you need in the same toolbar, created to better organize commands and presets that you often use together. A single row of options with sub-panels for even more tools and features. Everyone should be able to create professional banner ads with our tool. From now on, we represent an all-in-one solution for banner ad creation: new templates, cliparts, color presets, shapes, textures and so much more. You can choose one of our templates or start from scratch. We've got you covered. You can create banner ads for display ad campaigns and social media campaigns (Facebook, Twitter, Instagram, LinkedIn, YouTube) within minutes just by choosing one of our templates made by professional designers. 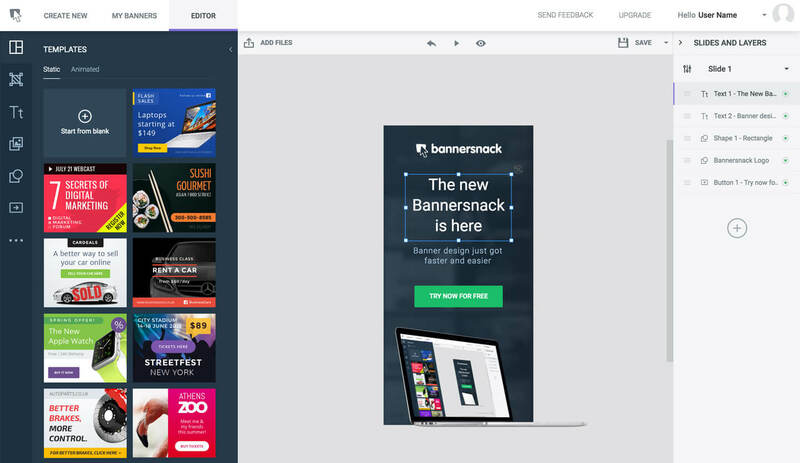 Bannersnack provides integrated solutions to offer a reliable and affordable experience for its users while creating banner ads. We've created a brand new interface to assure a flawless workflow with shorter loading times than anywhere else. Our banner ads are compatible with Google AdWords, Facebook Ads and all major ad networks. You can also easily embed our HTML code right into your website or blog in no time. Choose one of our smart embed options and display your ad right away.